In Adobe Creative Suite 5 (Adobe CS5) Illustrator you can choose from many effects, and they’re all applied in much the same manner. In this example, the zig zag effect is applied. 1Create a new document, choose any color mode, and draw a line in your document. 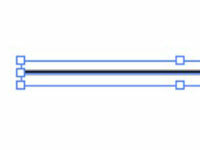 You can use either the Line tool or the Pen tool to create a straight line. For this example, make the path at least 3 inches long and positioned horizontally on the page. 2In the Control panel at the top of the Illustrator document, change the stroke to 3 pt and make sure that the fill is set to None. Using a 3-point stroke enables you to see the stroke a little better. 3Choose Effect→Distort and Transform→Zig Zag. 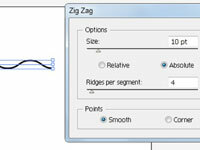 Choose the settings that work well to make your straight line appear as a zigzag. Smooth was selected to round out the points of the zigzag effect. Effects are linked dynamically to the object they’re applied to. They can be scaled, modified, and even deleted with no harm done to the original object.